The Daily Mirror leads with a "shocker". 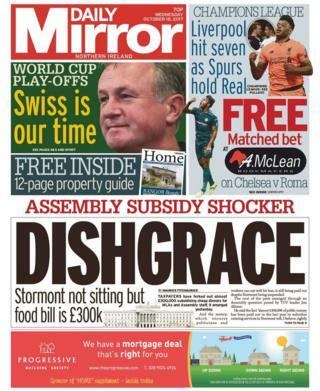 "Dishgrace" - that is how it describes the £300,000 spent in the last year "subsidising cheap dinners for MLAs and assembly staff". That is despite the fact the Northern Ireland Assembly has not actually sat since January. An assembly spokesperson said the subsidy continues under a contractual agreement and that in recent months it had been working with the contractor to review the service and minimise costs. The Belfast Telegraph has an exclusive on its front page - a UVF flag being displayed during a band contest in Carrickfergus Town Hall. The flag was displayed for 30 minutes during a display from Scottish band Greengairs Thistle. Greengairs Thistle's website, the Telegraph reports, states the band is excluded from taking part in Orange Order parades due to "links with paramilitary organisations". Alliance MLA Stewart Dickson said the display of the flag was "absolutely unacceptable" and "deeply disturbing". The Telegraph also carries comments from Democratic Unionist Party MLA Jim Wells demanding a probe into pro-IRA chants, allegedly at a GAA club in County Down. "Parties nowhere near deal warns taoiseach," is the stark lead headline in the Irish News. Irish PM Leo Varadkar was commenting on the current state of political talks aimed at restoring power-sharing. Image caption Leo Varadkar said the Good Friday Agreement got "very strong cross border support"
Mr Varadkar said the DUP and Sinn Féin were arguing over the "intricacies of an Irish language act". Speaking on a visit to County Kildare, he said hopes of a deal had receded. The Irish News reports that former US President Bill Clinton "sounded a more positive note" following his meeting with DUP leader Arlene Foster in County Down on Tuesday. President Clinton also held a separate meeting with Sinn Féin leaders. The News Letter also covers the visit, writing that it understands President Clinton "is reluctant to be seen as interfering in the process". The Irish News also gives coverage to nationalist criticism of comments made by Taoiseach Varardkar that changing the constitutional status of Northern Ireland on a 50% plus one basis would be something he "wouldn't like". However, in relation to the same story, the News Letter carries reaction from former Ulster Unionist Party MP Lord Kilclooney. He said that "in no way would one dare to have a united Ireland" on the basis on a 50% plus one vote as "the reality on the ground in Northern Ireland is there would be civil war". "Can you imagine the loyalists in Belfast taking it quietly, I couldn't," he added. The News Letter carries an opinion piece from Traditional Unionist Voice leader Jim Allister warning DUP leader Arlene Foster not to accede to a "rights-based" Irish language act in her party's negotiations with Sinn Féin. "To oblige would indeed be to feed the crocodile," Mr Allister writes.